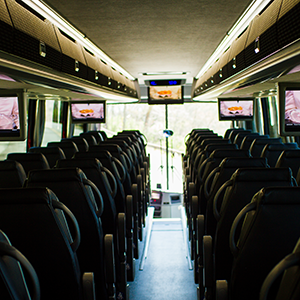 From the moment you step onto any of our motorcoaches, it’s clear. We pay attention to details. We make sure you have top-of-the line amenities, the industry’s most innovative technology and the most advanced safety features to ensure every mile of your journey is a smooth one, from coast to coast. Latest equipment innovations, including engine and emission systems. PREMIER’s new coaches are the most efficient, cleanest burning diesel engines available, increasing fuel efficiency by 17%. And the exhaust is actually cleaner than the air the engine takes in! Amenities may vary by coach. Please discuss options with your PREMIER Customer Service representative: 865-694-0304. Whether you are attending a business seminar, touring New York City, or heading to a summer retreat, our motorcoaches take you anywhere you want to venture, from across town to across the country. Headquartered in Knoxville, Tennessee, we proudly serve customers throughout the continental U.S., including Alaska, and Canada, offering a variety of coaches from comfortable standard to modern luxury. We offer pick up and return anywhere in the country. Request a quote to find out more. Operating a growing business for over a decade teaches you a few things, among which is that if you treat people right, exceed their expectations, and insist on excellence, they’ll come back, and they’ll tell their friends. We use PREMIER Transportation because we are confident that our transportations needs will be met in the best possible way. The PREMIER staff is always accommodating and available to answer any questions. The buses are clean and comfortable. The drivers are friendly, punctual and safe. We have built relationships at PREMIER and ask for drivers and office staff by name. Their personal service and dedication to excellence is what we love about PREMIER Transportation! I have used PREMIER Transportation for 10 years and I have always appreciated their customer service, professional drivers, and of course their clean and comfortable deluxe motor coaches. Safety is a priority with PREMIER, and I am extremely grateful that we have such a great transportation company in east Tennessee. Thank you! PREMIER is the best! These folks really love their work and its shows. There isn't a better bunch of professionals in the industry. PREMIER Transportation provides us with great service, well-maintained, clean buses, and safe drivers who are friendly, courteous, and professionally trained. They are great team players, assisting the tour director in making our trips enjoyable for our travelers. The office staff is very friendly and helpful in every way. I highly recommend PREMIER Transportation for all your group transportation needs. We have used PREMIER Transportation for our varsity athletic teams exclusively for the past 5 years, averaging around 200 trips per year. In that time, there have been only a small handful of minor incidents, and each one has been handled promptly and professionally. From top to bottom, PREMIER is a first-class organization that expects and exhibits professionalism and expertise in every single employee. I would like to compliment and thank the folks at PREMIER transportation for a wonderful experience on our recent trip. We were treated like royalty. The bus was immaculate; the driver was courteous and professional and everyone had a great time. Thank you. Whether we are moving 25 people or over 600, the personal service and attention we always receive from PREMIER is why they are our transportation company of choice. The customer service of PREMIER drivers is phenomenal and they make our trips enjoyable. On several occasions our Team Members have left valuable mobile devices on the bus and in every case we've been notified quickly. Last minute requests and schedule changes are handled with great flexibility. I always know one call to PREMIER will provide us with professional service at a reasonable cost that fits my budget. The safe transportation of our athletic teams here at Sewanee is very serious business. We are fortunate to have PREMIER Transportation to call on to provide that important service to us. Our coaches and athletes have found that dependable equipment, conscientious and courteous drivers and excellent customer service are the benchmarks of PREMIER. When my wife and I moved to Greeneville, TN to launch a new Young Life area, we didn't know anyone. PREMIER was by far our first choice to transport high school teenagers on our camp trips. To be honest, we wouldn't be where we are today if weren't for the staff at PREMIER. They have always gone above and beyond to help us with any and everything. I'm so grateful that we have a bus company in town that is honest and who truly wants the best for their customers. We consider the staff at PREMIER friends, and I'm so thankful for that.